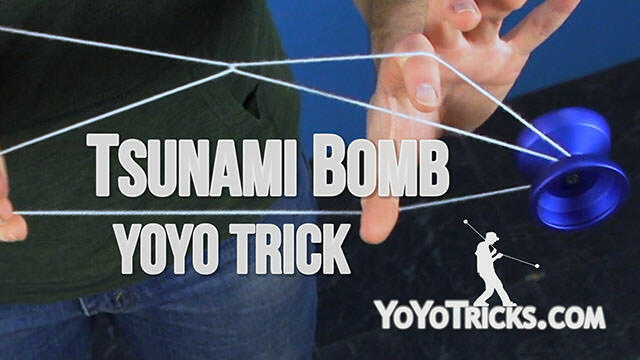 Learn how to do the Tsunami Bomb 1A Yoyo Trick. 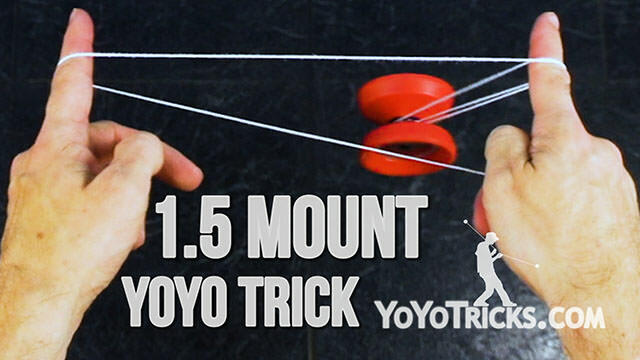 Tsunami Bomb starts with the 1.5 Mount. 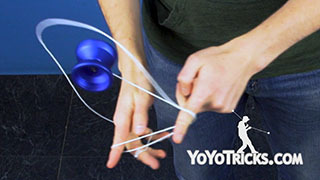 Then we are going to take our throwhand thumb. 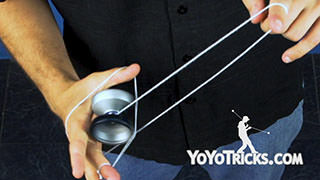 Put it underneath this top string, and pull it back as far as we can. 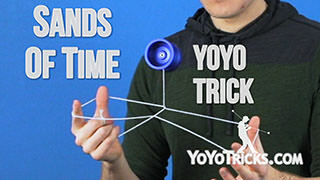 So this string is right at the base of my thumb, and not on the tip of my thumb. 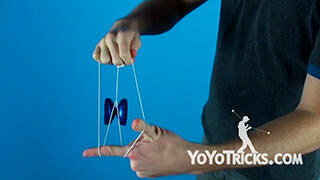 Then we are going to swing the yoyo toward our non throwhand side. 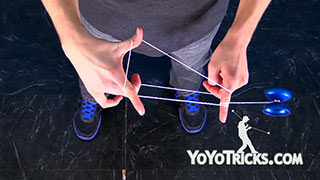 We are going to take our opposite hand pointer finger and underpass over this back string. 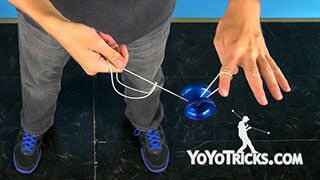 Then we are going to take the bottom three fingers on our throwhand and stick them out so that the string leading directly down to the yoyo is now on the back of all four of our fingers on our throwhand. 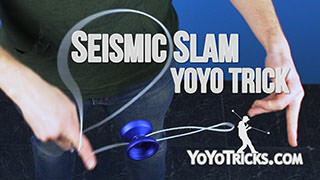 Then I am going to swing the yoyo over top toward the throwhand side of my throwhand. I am going to do a Magic Drop-like element. 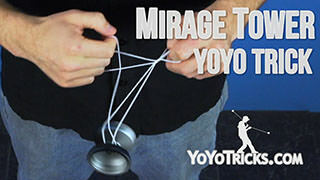 Land it on the string that the yoyo is on. 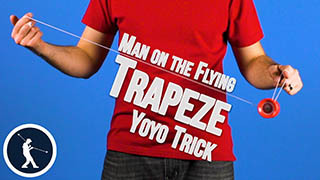 So it goes over my hand and lands back on the string that the yoyo was just on. 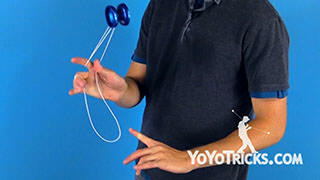 Then I can take my opposite hand pointer finger out, and I am in a Wrist Mount. So you can use just this element as a really cool way to transition from between a 1.5 mount and a wrist mount. 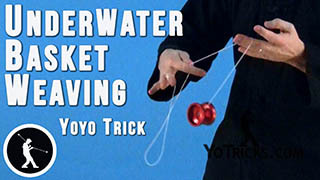 Now from here, I am going to take my opposite hand pointer finger and underpass the yoyo. 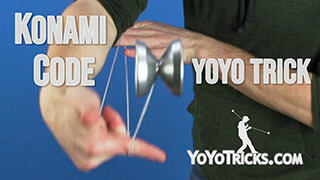 Now I am in a wrist mount, just like in Spirit Bomb. 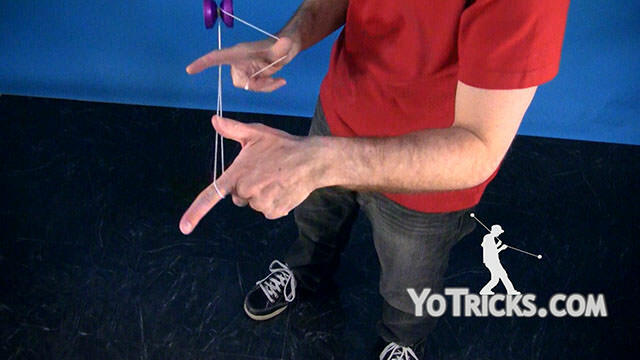 Next I am going to take my opposite hand thumb and hook it under this string that is coming from my throwhand thumb. 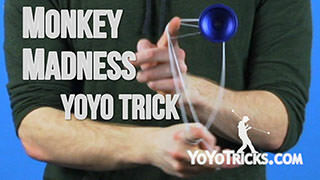 Then I am going to take my throwhand and remove it from the mount. I am in this heart formation. 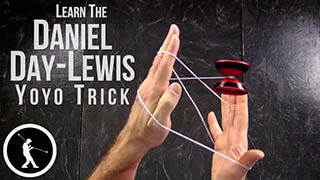 Then I can take my throwhand pointer finger and put it into the opposite hand side of this heart. 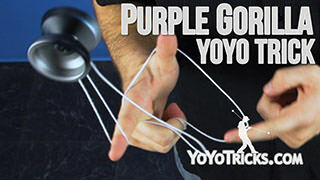 Then pass the yoyo over my throwhand pointer finger. 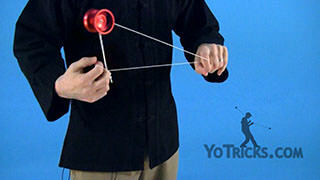 Then I can take my throwhand and put it back in that loop. I am right back in a wrist mount. Then from here I am going to take my opposite hand thumb. 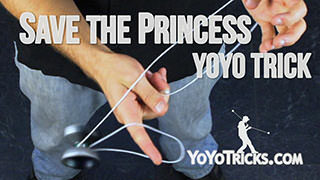 Put it into the throwhand side of the wrist mount. 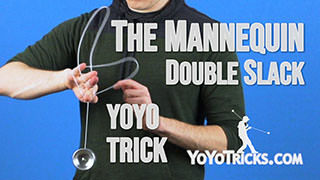 Pass the yoyo over top of the thumb, just like a chopsticks element. 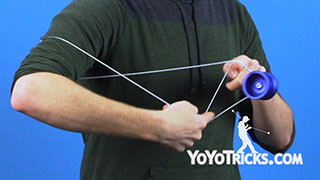 Then I am going to hop the yoyo straight up through this triangle on my throwhand, landing the yoyo back into a trapeze and then I can perform a bind. 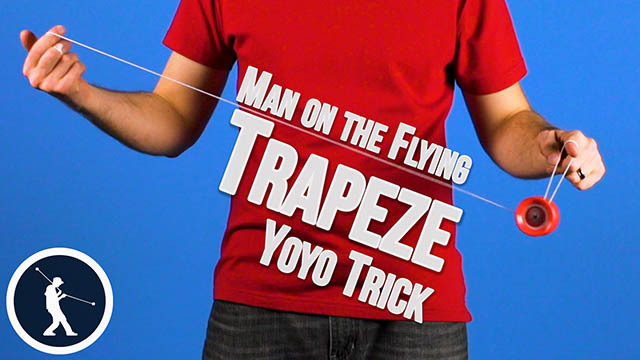 Now, if you are having any difficulty with this trick, we have got some tips for you. 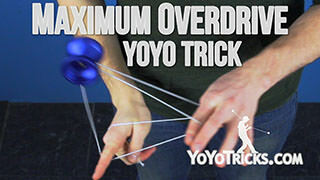 The first thing that you might be having difficulty with is the magic drop. 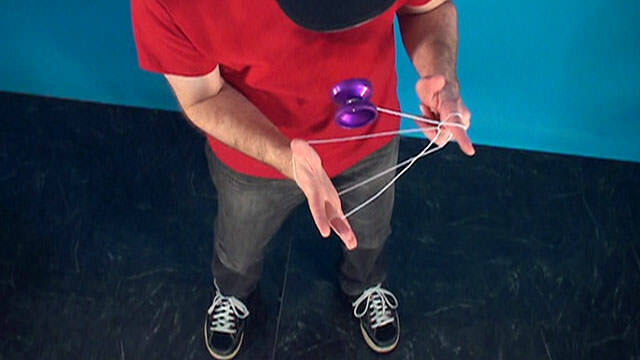 The best way to make sure that this works more consistently is to really get this back string as far back as you can get it. 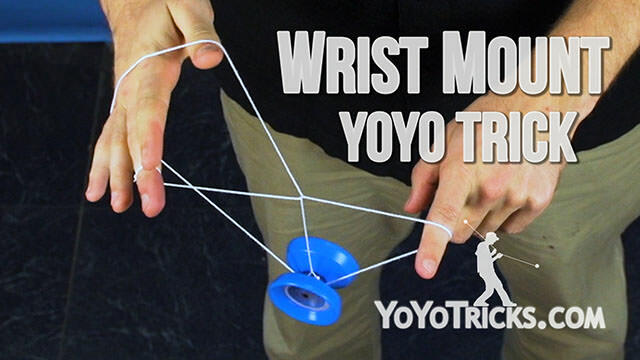 Maybe even all the way to your throwhand wrist. That is going to make the rejection a little bit more consistent. 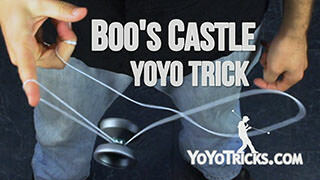 Now, the other place that you might be having difficulty is hopping the yoyo up through this triangle on your throwhand at the end of the trick. 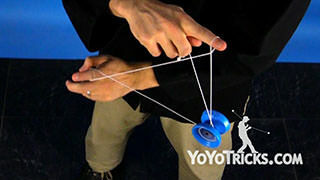 The best way to do that is, number one, make sure that the triangle is nice and big so the yoyo will fit through it. Secondly you want to raise both hands at about the same rate. 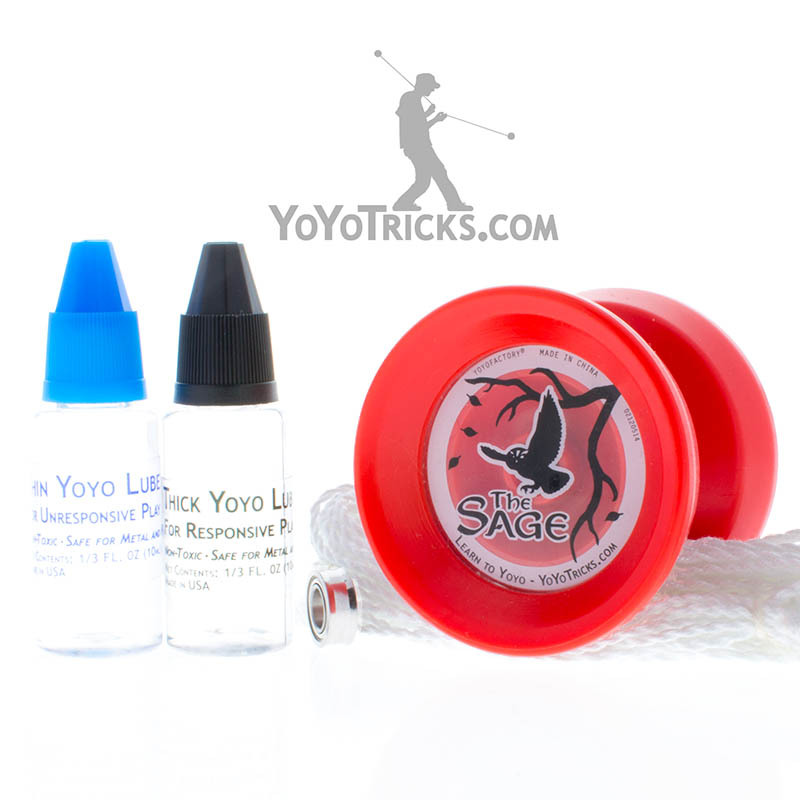 Then you want to take this loop off of your throwhand and kind of swoop it underneath the yoyo. 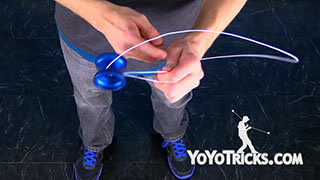 So I am going to make a C-motion like this, which gets the loop over the yoyo so that it can land back into the trapeze. And that is Tsunami Bomb.